Well this is something unusual. 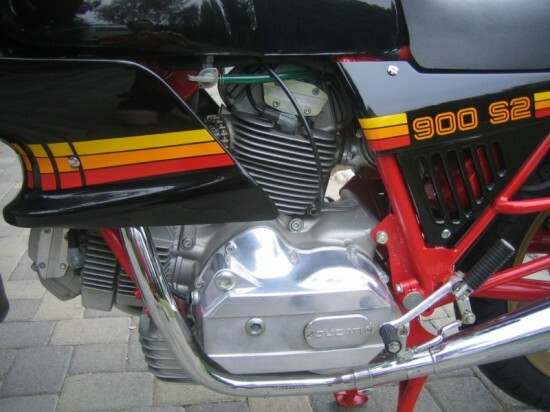 A 1983 Ducati 900S2 that’s never been titled? Zero miles? Never had gas in the tank?! Who actually buys a road-burning Italian exotic, then immediately decides to tuck it away for the next thirty years? Not me, but I’m glad someone does, so we have things like this to post. The 900S2 was, excepting the Mike Hailwood “Mille”, the ultimate and final incarnation of the venerable half-fairing v-twin superbike. 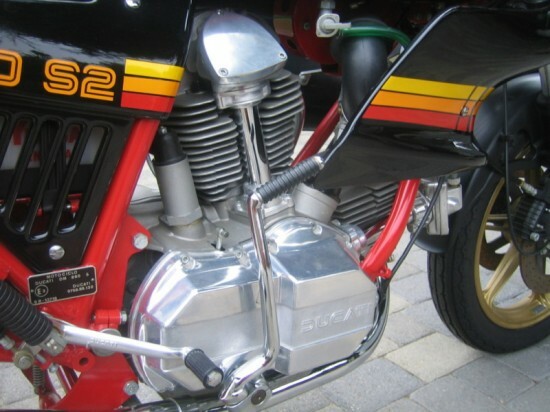 Obviously, by 1983, the bevel-drive Ducatis were getting very long in the tooth, but funds were not there to develop a worthy replacement, so the process of development continued in an effort to keep pace with competing machines. Interestingly, these bikes did not have side-stands, only center-stands. On earlier bikes, a folding handle was fitted to the left muffler carrier. This machine has the later design, a simple loop in the carrier to aid in deploying the stand. 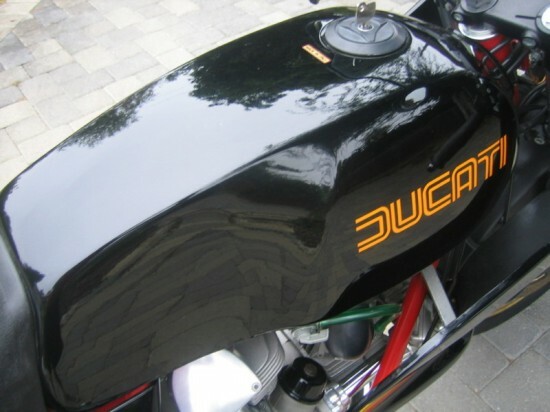 The fairing came from Ducati’s Pantah. Really, the design was a compromise, a parts-bin special designed to offer something new and keep the wolves at bay. MSO – MANUFACTURER’S STATEMENT OF ORGIN . BOLOGNA/ITALIA ARE WORDED ON DOCUMENT. THESE ARE WHAT THEY PROVIDE TO THE DISTRIBUTORS BEFORE TITLING. THIS BIKE HAS NEVER BEEN TITLED . “CLEAR TITLE” WAS ELECTED DUE TO EBAY’S LIMITED OPTIONS WHEN PLACING AD. ORIGINAL BATTERY NEVER FILLED WITH ACID. ODOMETER SHOWS “2” FROM PUSHING IN/OUT OF STORAGE. HEADLIGHT RED DOT STICKER FROM FACTORY STILL ON HEADLIGHT. INCLUDES ALL TWO OF EACH FACTORY KEYS, ORIGINAL TOOL KIT, MANUAL AND ALL DOCUMENTS . WELL PRESERVED IN MINT BRAND NEW CONDITION. IF ANY MINOR IMPERFECTIONS, IS HOW IT CAME FROM THE FACTORY. ORIGINAL TIRES, HOSES, RUBBERS STILL LOOKS FRESH/SOFT WITHOUT CRACKS. NO CORROSIONS OR FADINGS. BRAKES FUNCTIONS CORRECTLY WITHOUT FLUID LEAKAGE OR DAMAGE. CYLINDERS ARE LUBED AND ENGINES KICKS OVER WITH GREAT COMPRESSION. ALL SETTINGS REMAINS FACTORY. IT SHOULD START RIGHT UP AND READY TO RIDE JUST BY ADDING GAS AND MAKE SURE OIL LEVEL ARE FULL. THESE VINTAGE BEVEL TWINS ARE BULLET PROOF SOLID, SOUNDS VERY EXCITING AND RIDES SMOOTH. IT’S TEMPTING TO START IT UP. 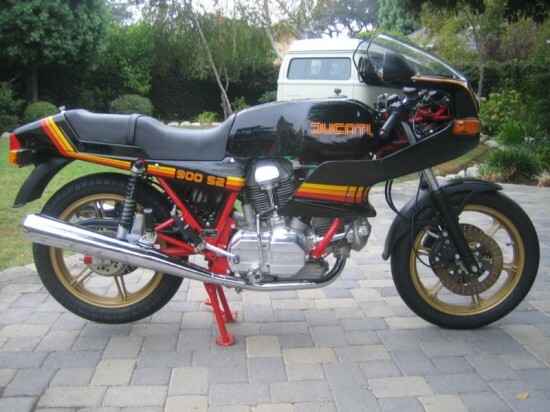 THIS IS A RARE CHANCE TO OWN A MSO VINTAGE DUCATI. IT MIGHT BE THE ONLY ONE IN THE WORLD IN SUCH CONDITION. This is obviously a collector bike, not one to ride: it’d likely need significant work before it’d run well, and you’d destroy the whole “zero miles” thing immediately. To me, it’s a curiosity, but collectors do dig on bikes like this that are perfectly preserved, not over-restored or resto-modded into something that appeals to more modern expectations for rideability and reliability: warts and all are preserved. Or would be if, you know: you were actually going to ride it. While at the time, the 900S2 was a last grasp at relevance for an obsolete sporting bike from a small, struggling manufacturer, it represents the nearly final incarnation of the iconic Ducati bevel-drive v-twin now. I’m curious to see how this time-warp example will stack up against more classic 900SS styled machines when the dust settles. 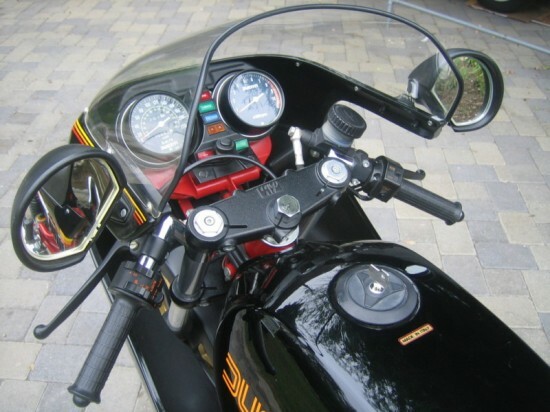 Next story One-Owner 1973 Moto Guzzi V7 for Sale!